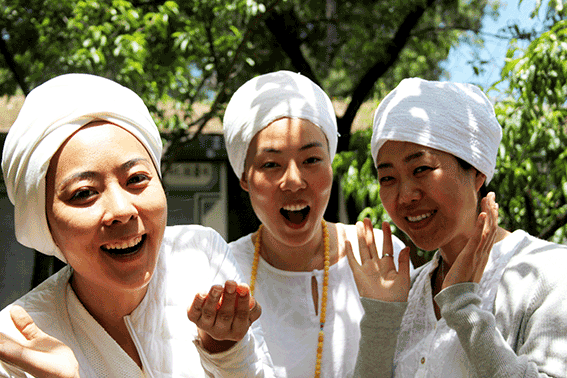 Inspired by Yogi Bhajan's teachings, AAA international School offers a path of self-initiation and self-qualification through Kundalini Yoga and complementary disciplines. We believe that the guarantee for both your spiritual and your personal growth is a close relationship with a teacher who can support you (Guruchela) and a community where you can be true and authentic (Sat Sangat). By connecting to your original self, you will recognize your truth, universal and beyond time and space. AAA will become your Home, a space where you will be nourished and also a space that you will nourish! We offer you an opportunity to heal your wounds, to reconnect to your purity and innocence, and to unfold your potential. AAA is a place of deep experience and transformation open to all. You are a spiritual being experiencing the illusion of separation and duality, and you need to water your infinite seed to feel complete and become consciously innocent. For both teachers and students, our school is a place of continuing learning and continuing teaching. The teachings are alive and the way to transmit and share them needs to be constantly updated. You will learn to cultivate a permanent connection with the unknown and with the flow of life, source of the perpetual and universal teachings. Once we lose the essence, we get attached to the form and our practice become empty. Our school is a place to integrate the teachings by questioning and experiencing them. We teach by example and our root is authenticity. You will learn the role and the responsibilities of a teacher from an experience which belongs to you. Our purpose is to share a path of self-transformation, so that you can take responsibility for your own destiny, and find your place in your community and in the society. Moreover, we hope you will go and serve humanity, with strength and an open heart, and that you manifest the totality through your finite self. Our school is a place of service (seva), a pillar for nourishing your soul and developing compassion toward yourself and others. We do not want you to consume another workshop or another training and go back home with the illusion to grow and with the same depression or frustration. Our school offers you the possibility to become actor of your own change.